I am local, and researched many assisted living facilities in Sun City Center and found Sun Towers to be the best fit for my Dad. We moved him here July 2017 from Connecticut to be closer to me. All personnel: Concierge Laura, administration, front desk, nursing, dining hall, housekeeping, maintenance – everyone – is courteous, friendly and caring. We contracted for the moderate assistance program – independent living, with his meds delivered and help with showers, laundry, etc, but meals in the main dining hall. Most staff is long term, and know the residents personally. For example, one day having lunch with my Dad, he passed right by the desserts; the lunch lady gave me a chocolate pudding with a smile, saying "he really likes this, take it for him" (and yes, he enjoyed it). I cannot give enough credit to Aretha and the nursing staff; what a wonderful and supportive group. Everyone I dealt with gave me peace of mind that we made the right decision, and my Dad was well cared for. This is an older facility, but well maintained and they are constantly making upgrades and improvements. The new social area on the ground floor is fantastic. The only complaint I ever heard from a resident is they felt "too young"; judge for yourself when you tour. I genuinely and absolutely recommend Sun Towers. Thank you for your review, it was so heartwarming to read. We believe caring is a calling and our values include providing compassionate, individualized service to all residents. Your words express that we achieved what we strive for each day. It was our pleasure having your dad as part of our Sun Towers family. Sun Towers Retirement was favorable and being renovated. The attitude of the staff was good. The person who assisted me was very knowledgeable and knew pretty much all the residents in the whole facility. They had the normal routine, but it was pretty quiet that day. They had a library, a meeting room, a hair salon, and an area for exercise. Thank you for your review Don. We are so happy that you were able to visit. The one thing you didn't mention is our country store run entirely by residents who make the purchases of all inventory, stock the shelves, close the sales and then donate ALL proceeds to our local nonprofit organizations such as the Sun City Center Emergency Squad and Security Patrol. Last year, they donated more than $8,000! We really offer something for everyone! I want to thank Laura for the incredible service she provides the residents of Sun Towers. It is always a wrenching decision to move from an independent free-standing home to a facility that provides so many services - the adjustment and understanding of how things work can be overwhelming and confusing. Her role as a transitions person is invaluable and her empathy and efficiency in fulfilling this role was greatly appreciated by me and my family. Our family is grateful to so many: Tosha; maintenance for their solutions to getting internet, phone and tv service to the apartment; the nursing department; Heidi in housekeeping; TJ for his role in relocating the remodeling equipment to another location once my parents moved in....everyone was so helpful in getting my parents settled. Except for the fact that the residents are a generation older than me, I would move to Sun Towers in a heartbeat! I will certainly recommend Sun Towers and its team to anyone I know. Laura and Tosha have been extremely helpful during the transition into The Towers. They worked with us to find an appropriate apartment. They explained the leasing process as well as the amenities. During and after the move, Laura checked to see if everything was ok, and coordinated with maintenance to perform some tasks. They helped to make the move easier, and both are a delight. I also want to commend Angel for going above and beyond. My rollator was delivered to my door, and at my request, Angel not only unpacked it, but also assembled it. This took Angel only a few minutes, but made a huge difference to me. Therese, the nurse, is also a great asset to Sun Towers. She's very competent, efficient, and yet takes the time to talk with you while performing her duties. She is outstanding! Laura H. is an excellent problem solver. She has helped me to get any number of situations resolved to my satisfaction. One of these was the timing of my laundry. She worked with the nursing team to schedule this to better fit with my preferences, which made me happy. She focuses on improving residents' experiences, which is much appreciated. My mother recently moved into the Memory Care Unit at Sun Towers. Prior to selecting Sun Towers I researched too many to count facilities in Bradenton, Sarasota, Ruskin and Sun City Center. I selected Sun Towers because of the positive attitudes of every employee you meet! My Mom is 94 years old with Alzheimer's disease and my prayer is that she experience joy at least once a day. In the past two weeks she has participated in a lot of activities, been fed good food, and had her personal needs handled with dignity. - all equaling many spurts of joy throughout he day! My siblings and I feel we made the right selection - Mom is safe and we see her happy for the first time in a long time! We have selected Sun Towers Retirement. The residents all seemed happy and smiling, and that wasn’t true at the other place that we went to. The rooms were just high quality. It’s an older building, but it is well maintained. Everything that we saw was very good. They have the same activities there. 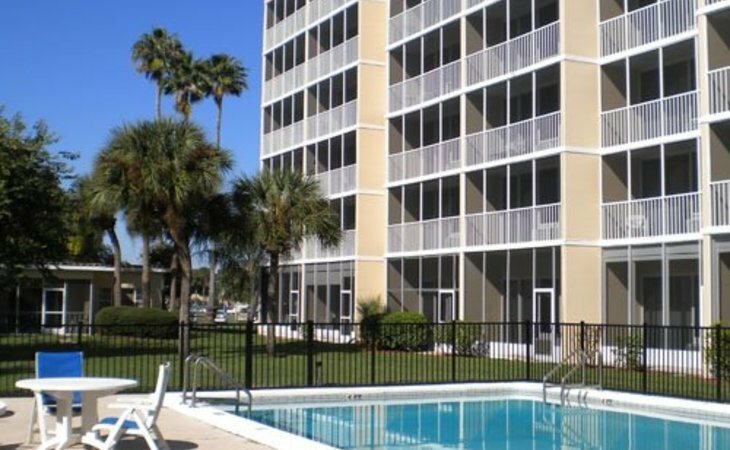 Sun Towers Retirement is modern, clean, and easily accessible, and the people are very friendly. They have a small pool and an activity room, and people come in and they do activities for the residents. I cannot list any one thing -- I am very grateful for everyone I have come in contact with during my stay here. Thanks to all! We are so pleased you feel that way. Thank you for the kind words! Sun Towers Retirement was nice and pretty decent. The staff was very polite and good. The apartments were medium-sized with enough room for one person. They had a lot of activities and transportation available for the residents. Food was served three times a day. My experience at Sun Towers Retirement was good, and the tour was nice. They showed me the facilities that I would be occupying. The one I was interested in was a two-bedroom unit with a full kitchen, living room, and little balcony. They provided different things like tours and field trips, and they'd take you to the doctor, shopping, or any place you needed to go. They had dining areas on every other floor. There was nothing I could see that was wrong. They have one-bedroom apartments and furnished apartments. They also have kitchenette apartments if you don't want a full kitchen. We couldn't be more pleased with your review and are excited to have you join us! My in-laws are moving into Sun Towers at the end of the month. The staff who toured us was absolutely wonderful, they’re very professional, and caring. My in-laws are comfortable enough to agree with them to move in. They were offered a one bedroom, 2 baths apartment which was perfect, of good size, and tastefully decorated with window treatments and neutral carpeting. The only thing I had a problem with is the kitchen was rather small and with no counter space, however, all the meals will be served. There’s a sink, stove top, and refrigerator. It was the lowest price of all the places. Their main dining area reminded me of a cruise dining room. There was a piano for entertainment. Breakfast and lunch is a buffet, and you actually have to dress for dinner. I liked Sun Towers, but it wasn’t what my aunt wanted. Nevertheless, I thought it was terrific. The facility was clean enough and nice. The residents were very friendly, very nice people. They had their own pets there. The dining area was fine, nice and large and looked like a cafeteria. The Towers (Sun Towers Retirement Community) was OK. They seemed to give you the best for your dollars, but then again, you might have to live on the eighth floor or something like that. I think they were fairer than the other facility. They have activities. They have a nursing home connected with them, which was made it more enticing. We're happy to offer the same price for our apartments regardless of the location within our community. With screened in lanais on each unit and wonderful views, all locations are great choices. Having our skilled facility "Sun Terrace" is indeed an added plus in providing a community where our residents have the ability to "age in place". I moved into Sun Towers 2 years ago. I lived in Dover, DE for 53 years. Although I miss Dover, Sun Towers makes me feel at home. The staff is always courteous and helpful. I have made many new friends. My in-laws are now settled in Sun Towers. They have more options, and they have lots of different floor plans. We are impressed by the staff and by the facilities. My in-laws say the food is very good. They have a one-bedroom, but they are on the waiting list for a two-bedroom unit. They had a full range of activities. It is by far the best of the facilities that we have toured. I am so pleased to hear that they have already settled in! We are happy to have them and look forward to getting them settled once more into the two bedroom home of their dreams. Studio apt. is very nice with screened in area overlooking a lake and swimming pool. Staff are wonderful, always providing great service and loving care. Sun Towers is a little older, but big, and lots of activities. It's almost an activity point for anyone in town. I go there every week -- once a month for Parkinson's support group -- and yesterday for an Alzheimer's group. They offer things to the community even though it's an assisted living. I know some people who live there, and they think the staff is very friendly, but the food could be better. The people are helpful. It has assisted and independent units, and it does have one floor for memory care. They have a pretty large outside area with a pool, a pond, and a duck. It has 250 clients, so I didn't think that was the place for my husband. The size of it would not be good for somebody who needs the care. A lot of them had kitchenettes, and I didn't want my husband anywhere near a stove or a microwave. They offer different floor plans, and their pricing is less than other places. I am now in my second year at Sun Towers. I am frequently ask if I am happy with my move to the Towers. My answer is always yes, I made a good choice! The staff and residents are caring and friendly and it is nice knowing I am never alone and can get help if ever I need it. There are many activities and sometimes special programs to enjoy. I can be as busy as I wish, or just be by myself and relax in my apartment. Is life at the Towers perfect? No life just is not perfect where ever you are, but as a famous quote says, "Perfect is not normal, nor is it interesting. "We have many positives here for all the above reasons. I am happy to call Sun Towers my home! My husbands Grandfather is a resident of Sun Towers. We moved both him and his parents here from Arizona so we could be closer to them as they are getting older. We had him in an assisted living facility in Arizona that was very upscale and expensive. We only wanted the best care for him in the world and new he was a bit fussy and difficult. He was NOT eager to move out of it at all and very reluctant to move to Florida for that matter. He was a bit tricky to work with so it was very important that we had a facility that could handle his mood swings and temperament. Even though his apartment in Arizona was very nice, he seemed to not be happy much of the time which made us determined to find a suitable place that would be able to work with him. After looking at a number of available apartments, we decided on Sun Towers. The price was very reasonable for the level of service and care and the staff seemed to be very eager to help. Well, all I can say is we made the best decision ever! He couldn't be happier with his arrangement at Sun Towers. He absolutely loves it and his attitude about Florida and his housing have been nothing short of a miracle. He RAVES about how the staff spoils him all the time. I visit him every Friday and he is always telling me how well they care for him and how they come up to his room just to chat. I almost can't believe that these words are coming out of his mouth. He is so happy here. I can't thank the staff enough for how kind and supportive they are and how pleased we are with the attention he gets and how welcome and friendly they are toward him. From the food to his apartment, everything is professional in an "at-home" sort of way. Whenever I go in there, I feel this way too. Thanks Sun Towers for making a difference in all of our lives! In September 2014, while going to breakfast, I had a heart attack. I took a nitroglycerin tablet. Returning to my apartment, I had another heart attack and I took another pill. Reaching my apartment I phoned my V.A. Case Load Home Base Manager, Mrs. Russell and informed her of the attack. Feeling better, I went to lunch with my son. Arriving back at my apartment, I had another heart attack, I took another pill and laid down. I don't remember answering the phone. Mrs. Russell, unable to make any sense in our conversation hung up and called the nursing station here at Sun Towers. Katrina answered the phone and came to see me. She put me in a wheelchair and took me to the lobby and put me in an ambulance and sent me to the hospital. She saved my life. In the hospital for the next five to six weeks, I had a heart overhaul. Cleaning it up, cleaning the stents that were there and adding more as necessary. The electro-physiologist doctor replaced my pacemaker with a new type of defibrillator which can reprogram my heart. The staff here at the Sun Towers are really great, from the everyday worker to the top CEO, Mr. Nelson. If it were not for all of these wonderful people I would not be here now. I recently returned from a month's vacation to Connecticut for the Christmas holidays. I was amazed at the welcome I received from my dinner friend and others who noticed I was missing for some time. I especially was thrilled that Michael, in the dining room was so happy to see me back and was worried about me. A fine gentleman. We chose Sun Towers as first of all they had availability, and that was the biggest thing. It goes from independent to assisted living care. The rooms were nice and big. They had social activities for the residents which was important for my husband. Everything is nice and clean. Maintenance is kept up to date. There is a happy hour, and my husband plays cards, so there is card playing, and they go out for meals once a week. Sun Towers is very nice. It's just that it's a rental. If we move in there it would be about the same price a month with our current place. However, when we ran out of money they would take us out and we can't afford that. The place itself is attractive. They give you 3 meals a day if you need them. The people there are friendly. They have therapy, a fitness room, library and other amenities. I only saw their smallest room which was quite adorable and most of them have a little porch. I am ecstatic that my father has found a permanent home at Sun Towers! He requires a high level of hands on care around the clock, and they are able to provide that for him. He moved in from Sun Terrace where he received excellent rehabilitative services. When he went into Sun Terrace he was wheelchair bound and could not support his weight. When his rehab was completed he was able to walk small distances with only assistance to stand. We were very limited in our choices of facilities that could provide the level of care that my father needs because he is insulin dependent. Sun Towers is able to check his sugar and give him his shots at any time because they have licensed nurses on staff 24 hours a day! The nursing staff is very kind and gentle with him. He loves it there, and tells everyone that he feels like he lives in a fancy hotel. The care they provided my mother in her 2 years there until her death in Junes was exceptional. All my questions and concerns were dealt with promptly. Tosha and TJ in the Towers and Christine and the physical therapists at the Terrace were so helpful. It eased my mind greatly as I was 12 hours away but knew my mother was in excellent hands and dealt with her eccentric ways. cheerfully. The rooms were really nice and very spacious in Sun Tower. They were friendly; they answered all the questions and they followed up and called back. They had a beautiful dining area. There seemed to be a lot of activities going on. But they just have a long waiting list. We like everything about the Sun Towers. It's clean and the staff is really good. There's a lot going on every time you walk in. It's just kind of upbeat with all kinds of activities every day. The food is good and they have a nice, big dining room. I am the family member of a resident of Sun Towers. I cannot put into words how happy I am that I placed my mom in their facility. Not only does their staff go above and beyond the normal call of duty, but as my mom bounced back and forth between independent and assisted living (WITHOUT HAVING TO SWITCH APTS!!!) they were on top of things and she got the immediate care and therapy she need post haste! The support groups have also been a blessing. In dealing with the loss of my dad, I was able to attend their grief support group with her and was thrilled to learn of all the other resources that Sun Towers offers! I will always recommend Sun Towers as I know they will take the absolute best care of my mom until her final days. I take security in knowing that. I felt like this company was ran the wrong way at times. The staff were sometimes rude and not caring to the residents. I have noticed some of the staff seem to not fully do their job as their job title stated. Althought the physical therapists were great, they always care for the residents they were assisting and they always wore a smile on their face. I feel like if I were to look for a location for a family member of mine I would choose somewhere else to take them. I know that somethings have changed here a little like the new lockdown unit but I still think they have a ways to go. I go to physical therapy as an outpatient three days a week at Sun Towers Retirement. It's a really lovely and sweet place. The physical therapists are excellent. I can't say anything bad about the place. I really like it. The staff is excellent. Everybody's very caring and considerate. They have transportation to doctors' appointments and to stores. The 1-bedroom apartment was very small. They have activities, housekeeping, a dining room, three meals a day, a swimming pool, dancing, bingo, a beauty salon, happy hour, and live music. There's not much of a view in the front because it's more like a parking lot, but you will get the trees and pretty scenery at the back. Thank you for your kind words Gail. We're happy to hear you are having a good experience in therapy. I have a 600* unit with a bedroom, bull bath, living room and a completely equipped kitchen. Plus a walk in closet and coat closet. More that adequate for my needs and arranged nicely with a screened in balcony. I have no pets but the people that do seem to have no problem walking their dogs, and the animals are quite froemd;u. It is very nice to have the staff know your name, and can answer most questions.. Management is available for major problems and are always quick to untangle problems. The food is institutional grade. With almost three hundred residents they do go further to learn preferences i.e. no gravy, or dessert to go. Ig's not my home cooking, but I guess you would get 300 answers on what goes in or on a meatloaf!! Being visually impaired I appreciate that my apartment is cleaned weekly, and if I drop and break a glass I can get help cleaning it up. Activities are limited for me due to vision, but we can take a but to go out for dinner weekly, and several organizations meet here monthly. Overall a good value for the comfort and safety of the residents. We're happy you find Sun Towers Retirement "a good value for the comfort and safety of the residents". My mother-in-law just celebrated her first anniversary of living in Sun Towers. She could not be happier -- moving here was the perfect place for her. She feels safe and cared for. The staff is wonderful to her and very receptive to requests -- the little things that make a place a home. Just after she moved in last year Hurricane Irma came to town. Mom was very happy with how the staff gathered everyone and had activities for residents. She felt really safe as the storm came through. Recently she had a choking episode at dinner and the staff jumped immediately into action, got her through the danger stage and got her into an ambulance and on to the hospital. They called us immediately and briefed us on the incident. My husband and I travel a good bit and before she moved to the Towers we worried throughout our trips. Now we can leave town knowing she is in good hands. She brags to all her friends about how happy she is and how good everyone is to her. What a wonderful place! Thank you for your words of praise. We are blessed to have your mother-in-law with us and are so happy to know you have peace of mind when away. Our greatest reward is to know she is happy! Sun Towers is our first choice. It's a bigger community than the other one we visited; it's about ten stories tall. The rooms are also a little bigger and they all have a screened-in lanai that they can go out to. They have a chapel, and a newly added snack bar, so if people come and visit you can go there and get a donut or a soda or whatever. They also have a little store with volunteers there, and you can get toilet paper or shampoo if you need it, instead of waiting for the Wednesday ride to Walmart or whenever. We saw the food they were serving and it was fine. Thank you for the kind words David. We are blessed to share our community with seniors who are seeking a great retirement environment. We think Tosha is one of the best parts of Sun Towers too! We're so happy that they are enjoying their new life with us. All of the staff of Sun Towers have my thanks. Each one was most helpful while the residents were located on the first floor. It was much appreciated since many of them had personal problems because of the storm and still came to help us. Thank you all again. Our team members at Sun Towers are dedicated to ensure the safety of our residents and are happy that you felt cared for during the storm. Thank you for the review. It is our pleasure to see to it that you are comfortable and enjoy your days with us as part of our family. TRIPLE WOW-ie!!! We here at The Towers and The Terrace were blessed three times. First we were blessed when Mother Nature (Our Father in Heaven) down-sized Cat 2 Hurricane Irma from a Cat 2 to a Cat 1 just prior to approaching Sun City Center, Fl. We were blessed again by all of the pre Irma preparation; the organized and efficient roll call as we were all ushered from our apartments down to the preparation rooms on the first floor; and the post Irma work of cleaning up in and around our building after the fact. All of these things were directed by our very capable management team and carried out by them and by their very efficient in-house employees. All staff members and the in-house workers were with us every step of the way from our apartment departure of around 4pm on Sunday until we were escorted back to our apartments nine hours later at approximately 1am Monday. I am so grateful to all involved here in Sun Towers and Sun Terrace; by having all of their employees downstairs with us, serving food and drinks and helping us in any way that was necessary. Our high anxiety level was indeed lower a lot with their presence and that was our third blessing! YOU ARE THE BEST ---- Out of 5 stars I give you a 5-plus. Thanks. Char. I have lived here in The Towers for 2 years and 11 months. Thank you for the kind words Char. We're so happy that you felt well cared for and we are blessed to have you as part of our family! I am a current resident of Sun Towers, my wife and I moved in on 4/18/2017. It was a week or two before we got our "sea legs" even though the staff bent over backwards to welcome us and show us the ropes. We quickly made some friends and soon were a member the community. I'm writing on Mon. 9/11/17 (that is an ominous date in our country) However in this case, the date is very positive, this is day after Erma hit Florida. Almost all employees were brought in on Sat. and were told to be prepared to spend both Sat. and Sun nights at the facility, staff members who had family at home were encouraged to bring families to Sun Towers. All upper floor residents were evacuated to the first floor, all first floor windows and doors were protected with plywood. The kitchen and wait staff were outstanding as were the management and their staff. Care givers were on duty helping out where ever they were needed, at some point it almost seemed that there were more help then residents on site. Every employee whether management, care givers or service staff acted as if we were doing them a favor by asking for some kind of help. They treated us with courtesy and respect even though dealing with some abusive behavior by some of our residents. We came through the ordeal in tack no major damage, no loss of electricity or air conditioning. Not that I would want to deal with another storm but I feel confident that we would make it through it. We are so pleased that you had a great experience despite some challenging circumstances with the storm. We are a close community and are grateful to have you as part of the family. Thank you for your kind comments! Sun Towers was great. They're very informative and inviting. According to my sister, they couldn't be more gracious and helpful. The room has all fresh paint and new carpeting, and everything is cleaned once a week. The dining room is huge. There are movies, bus excursions, a beautiful pool, and everybody has a screened in porch to get outside a little bit. We strive for every resident to feel like family and are happy to know you are having a good experience. Thank you for the kind words. Sun Towers Retirement Community was quite good. It was an attractive place. The rooms were sunny. All necessities were provided, and the staff that showed us there was very pleasant. They had bus trips, and I saw people playing games. The price was just a thousand dollars too much for us. We went to visit Sun Towers, and it was absolutely wonderful. The place was very clean. The people were super friendly and working with me nonstop. We ate there as well and the food was very good. I would highly recommend the place. They have an activity center where they do their activities, and they have a big screen and the residents would watch movies. They also have bingo and arts and crafts. I saw that the residents were just happy. I didn’t hear bad things from the residents. I toured Sun Towers, and it was very good. The dining area looked good. They had amenities like most other places, like a library. The scenery was average. They lady was very nice. I would recommend it. Sun Towers Retirement was a nice place. Overall, I think it would fit our needs. The staff seemed nice and qualified. The rooms were spacious, and they have updated quite a few of them, so that seemed very nice. We saw their dining room, which seemed nice, but they did not invite us to eat there. We chose Sun Towers Retirement. We can bring our golf cart and many of the stores right there are accessible. It had everything that we were looking for. They offer independent, assisted, and nursing as well as memory care services. They have very good-sized rooms, but their prices are reasonable and within our price range. They have happy hours, trips, and offer transportation. Our team members at Sun Towers Retirement Community are excited to have you join our family! Welcome! Overall, Sun Towers was the best all-around offer for retirement living in that environment of living. The accommodations were nicer and larger than most. The availability of facilities and in-house things, e.g., restaurants, exercise, and so forth was above the other standards. Sun City Center offers one thing that no other can offer and that is the fact that you don't have to have a car. You can drive a golf cart to everything. Sun Towers is a big high-rise facility. I saw an apartment there that has one bedroom. It didn't have a den like the one I have in my own apartment. Their amenities are comparable to the ones where I am at now. They also have their bus that takes their residents to places. They provide meals and everything. They also have assisted living. Sunrise takes pride in offering the kind of service and environment that merits the praise and confidence of our residents and their families. Constant communication with our residents and families in forums like our resident council, family meetings and customer satisfaction surveys help us to always improve. For more information on the services and amenities available for the care level you are seeking, please give us a call or stop by the community. You’ve grown accustomed to an independent lifestyle. That won’t change at Sun Towers. Maintain Your Independence with access to our continuum of long term care services. What should caregivers and potential residents know about Sun Towers Retirement?